4 cards (un-numbered series of 100) issued in 1897. ref book nos 23, 25, 27 & 28. 4 cards (un-numbered series of 100 - brownish paper) issued in 1897. ref book nos 29, 31, 33 & 35. The cards are generally in good condition, a little grubby with light edge and corner wear.They are presented within protective plastic sleeves. I have provided pictures of both the pictorial and printed sides of all the cards, so, you can judge the condition for yourself. W.D. & H.O. Wills. FULL ORIGINAL SET FROM 1911. Original Cigarette Cards issued in 1911 entitled. Brooke Bond Tea African Wildlife. Kellogg British Military Aircraft. Brooke Bond Tea Incredible Creatures. Brooke Bond Tea Unexplained Mysteries. Among the rest I can see. YEAR OF ISSUE- 1935. SERIES TITLE - famous british liners 2nd series. CARDS FOR SALE- 30. CARDS ARE FROM YEAR STATED REPRODUCTIONS WILL BE CLEARLY STATED AS REPRODUCTIONS. CARD SIZE- large. YEAR OF ISSUE- 1928. CARDS FOR SALE- 50. CARDS ARE FROM YEAR STATED REPRODUCTIONS WILL BE CLEARLY STATED AS REPRODUCTIONS. CONDITION - v good through to excellent. YEAR OF ISSUE- 1905. SERIES TITLE - nelson series. CARDS FOR SALE- 50. CARDS ARE FROM YEAR STATED REPRODUCTIONS WILL BE CLEARLY STATED AS REPRODUCTIONS. CONDITION - v good through to excellent. A Hard to complete set 30 cards from WILL'S Issued in 1934 of FAMOUS BRITISH LINERS. A super set showing the most famous liners crossing the seas of the 1930's before the war destroyed most of them. (OVERSEAS). THREE SCARCE TYPE CARDS FROM THE WORLD'S DREADNOUGHTS. (NO ITC CLAUSE). ISSUED IN 1910. MY REF 10-9-8. 24 cards in total. Condition : Used. Very good clean overall condition. Ready to hang / display. YEAR OF ISSUE- 1934. SERIES TITLE - famous british liners 1st series. CARDS FOR SALE- 30. CARDS ARE FROM YEAR STATED REPRODUCTIONS WILL BE CLEARLY STATED AS REPRODUCTIONS. CARD SIZE- large. YEAR OF ISSUE- 1911. CARDS FOR SALE- 50. CARDS ARE FROM YEAR STATED REPRODUCTIONS WILL BE CLEARLY STATED AS REPRODUCTIONS. CONDITION - v good through to excellent. Cigarette cards. Wills. The Worlds Dreadnoughts 1910. A set of 25 cards. Cat Value £75. YEAR OF ISSUE- 1931. SERIES TITLE - strange craft. CARDS FOR SALE- 50. CARDS ARE FROM YEAR STATED REPRODUCTIONS WILL BE CLEARLY STATED AS REPRODUCTIONS. THIS IS A FULL SET OF ORIGINAL CIGARETTE OR TRADE CARDS. YEAR OF ISSUE- 1924. CARDS FOR SALE- 50. CARDS ARE FROM YEAR STATED REPRODUCTIONS WILL BE CLEARLY STATED AS REPRODUCTIONS. W.D. & H. O. Wills, Bristol. Very Good Clean back and front, may have dirty and softened edges and rounded corners. No creases. Excellent Clean back and front, including edges, sharp edges and sharp corners. 4 6 7 15 16 25 26 31 32 33 34 41 42 43 45. Selection of 15 different cards. The photos show the cards you will receive. CARDS AT BARGAIN PRICES. New listingJ. PLAYER. 1931. SHIPS FIGURE HEADS CARD NO 14. SEE DESCRIPTION. THIS LOT FOR AUCTION CONSISTS OF A SINGLE CARD FROM THE SET SHIPS FIGURE HEADS CARD NUMBER 14. DESCRIBED AS BEING IN A VERY GOOD CONDITION, BUT PLEASE DO CHECK OUT PHOTOS FOR YOURSELF , AS THIS IS THE CARD YOU WILL RECEIVE . I AM DOWNSIZING MY COLLECTION,, AND I AM SELLING OFF MY ODDS , AND ENDS SINGULARLY, TO HOPEFULLY MAKE IT EASIER FOR YOU TO GET WHAT YOU REQUIRE. I WILL COMBINE POSTAGE ON MULTIPLE BUYS. FOR SALE IS A WILLS. (1924) (A). CIGARETTE CARD COLLECTABLES. (Nos; 7, 8, 10, 12, 13, 14, 15, 16, 20, 21). I am currently trying to get through a load of "odds" many of them of higher values but where it is unlikely that I will ever complete a set. All my cards are despatched in card backed envelopes for protection. 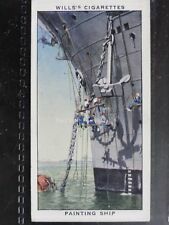 WILLS, FAMOUS BRITISH LINERS, 2ND SERIES OF 30 LARGE CARDS ISSUED IN 1935 "EXC"
W D & H O Wills, Famous British Liners. 2nd Series of 30. Original complete set of cigarette cards issued in 1935. Condition - Excellent. WILLS, FAMOUS BRITISH LINERS, A SERIES OF 30 LARGE CARDS ISSUED IN 1934. W D & H O Wills, Famous British Liners. A Series of 30. Original complete set of cigarette cards issued in 1934. Condition - Varies; good to mainly very good. Royal National Life Boat Institution Full Set Mint Condition in Sleeves Will Post 1st Class See Photos Also Combine Postage Thanks for Looking. Of Strange Craft 1931. Green Mount. 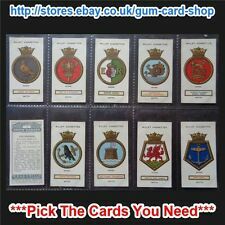 This lot is a full set of 30 Large (B) cigarette cards by WD & HO Wills;Famous British Liners - First Series. Complete original set in very good condition. John Player Cricketers. Wills cigarettes Roses. NO, NEVER. Is the item in the photo the actual item I am buying?. The item in the photo is the exact item you will receive. J. PLAYER. 1926. SHIPS - MODELS. CARD NO 5. SEE DESCRIPTION. THIS LOT FOR AUCTION CONSISTS OF A SINGLE CARD FROM THE PLAYERS SET SHIPS - MODELS 1926. CARD NUMBER 5.. DESCRIBED AS BEING IN A VERY GOOD CONDITION, BUT PLEASE DO CHECK OUT PHOTOS FOR YOURSELF , AS THIS IS THE CARD YOU WILL RECEIVE . I AM DOWNSIZING MY COLLECTION,, AND I AM SELLING OFF MY ODDS , AND ENDS SINGULARLY, TO HOPEFULLY MAKE IT EASIER FOR YOU TO GET WHAT YOU REQUIRE. I WILL COMBINE POSTAGE ON MULTIPLE BUYS. J. PLAYER. 1926. SHIPS - MODELS. CARD NO 2.. SEE DESCRIPTION. 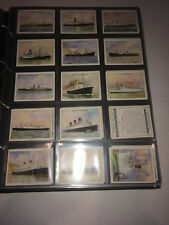 THIS LOT FOR AUCTION CONSISTS OF A SINGLE CARD FROM THE PLAYERS SET SHIPS - MODELS 1926. CARD NUMBER 2. DESCRIBED AS BEING IN A VERY GOOD CONDITION, BUT PLEASE DO CHECK OUT PHOTOS FOR YOURSELF , AS THIS IS THE CARD YOU WILL RECEIVE . I AM DOWNSIZING MY COLLECTION,, AND I AM SELLING OFF MY ODDS , AND ENDS SINGULARLY, TO HOPEFULLY MAKE IT EASIER FOR YOU TO GET WHAT YOU REQUIRE. I WILL COMBINE POSTAGE ON MULTIPLE BUYS. 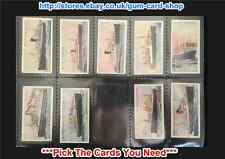 This lot is a full set of 30 Large (B) cigarette cards by WD & HO Wills;Famous British Liners - Second Series.